A fantastic one way run between Halifax and Dartmouth, using the Macdonald Bridge and the ferries for the return. Start in downtown Halifax at the ferry terminal. 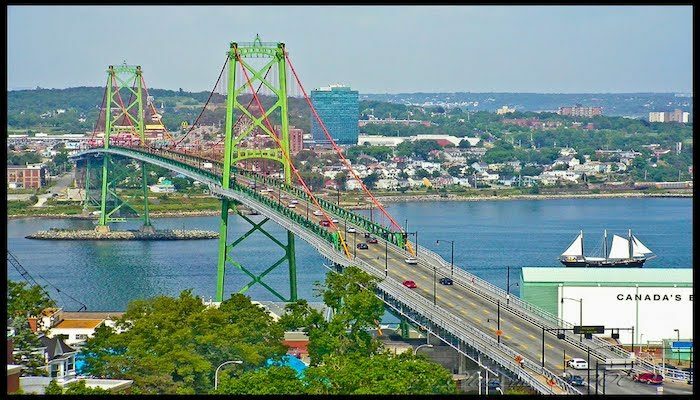 Run north along the waterfront trail, and take the Macdonald Bridge over to Dartmouth. The bridge is ~1 mile from entry to exit (follow map carefully to get onto bridge). Once on the Dartmouth side, head south and skirt the Dartmouth Common, heading down Alderney Dr. to the waterfront trail, which starts at the Alderney Ferry Terminal. Then, there is a terrific waterfront trail around Dartmouth Cove for ~2 miles between the Alderney Ferry terminal and the Woodside Ferry terminal. Great views of the water and Halifax skyline. Then take the Woodside Ferry back to downtown Halifax! Of course, there are numerous options to vary the route — one can reverse it by taking the ferry to Darmouth and running back ti Halifax, or taking the Alderney Ferry. Doing a loop around Dartmouth Common adds ~1 mile. Note: As of January 2017, the bridge is under construction and pedestrian use is not permitted.